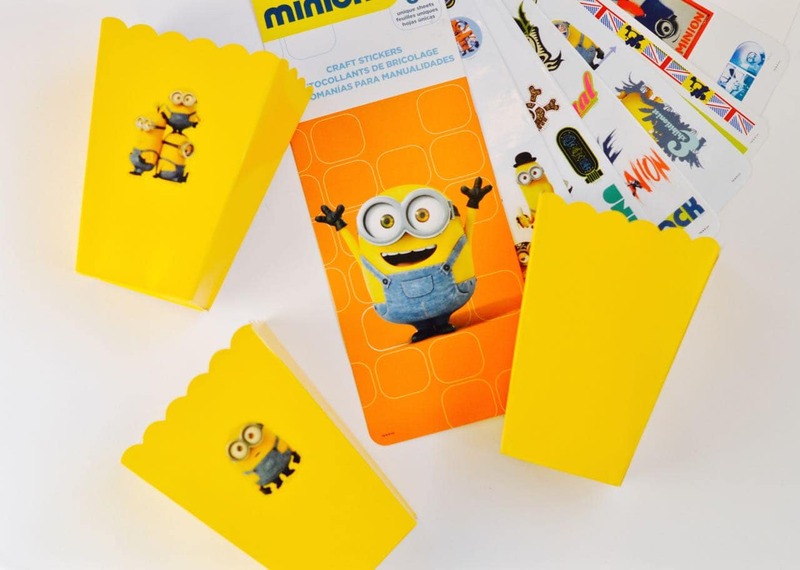 Kids and adults everywhere have fallen in love with those adorable little yellow minions. And how could they not? They love say the funniest things, love to party, and all they need to be happy is each other and a horrible villain to serve. 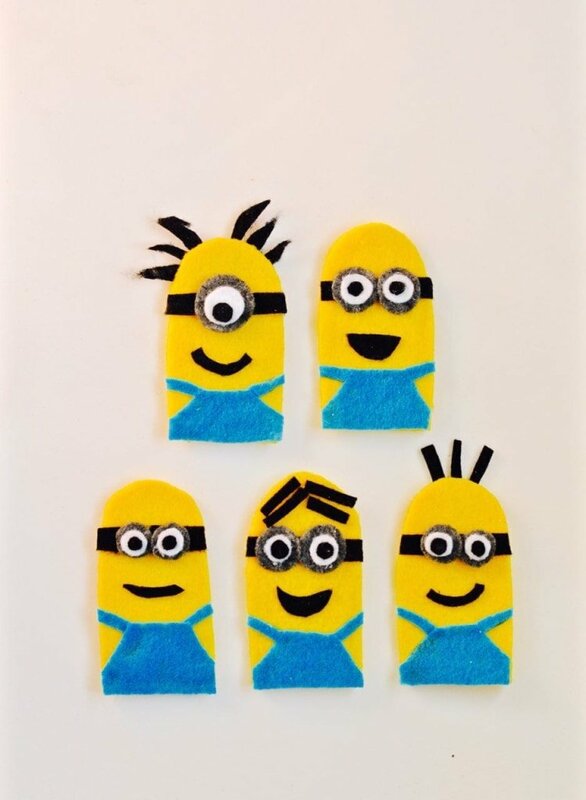 With the recent release of the Minions movie, I thought it would be fun to surprise my kids with a Minions movie party, complete with decorations, treats, a fun minions finger puppet craft, and then watching the new movie together. My kids think I’m pretty much the coolest mom ever now. 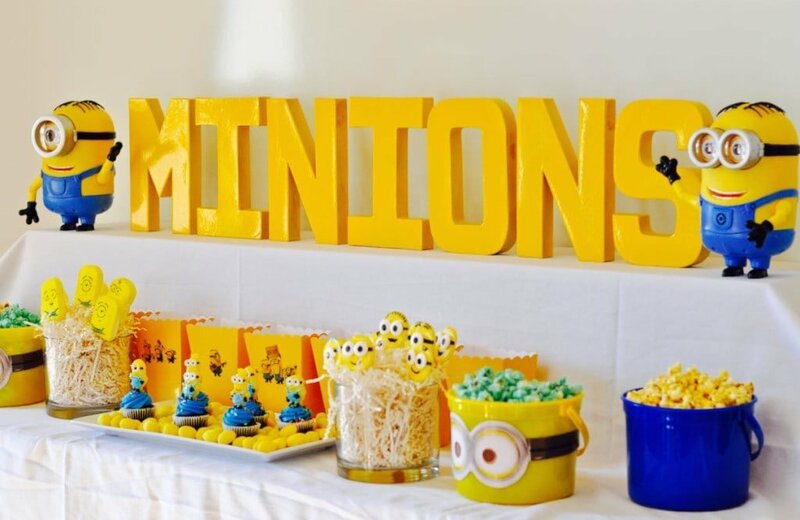 It’s really not hard to throw a minions party, even though it might seem overwhelming at first. 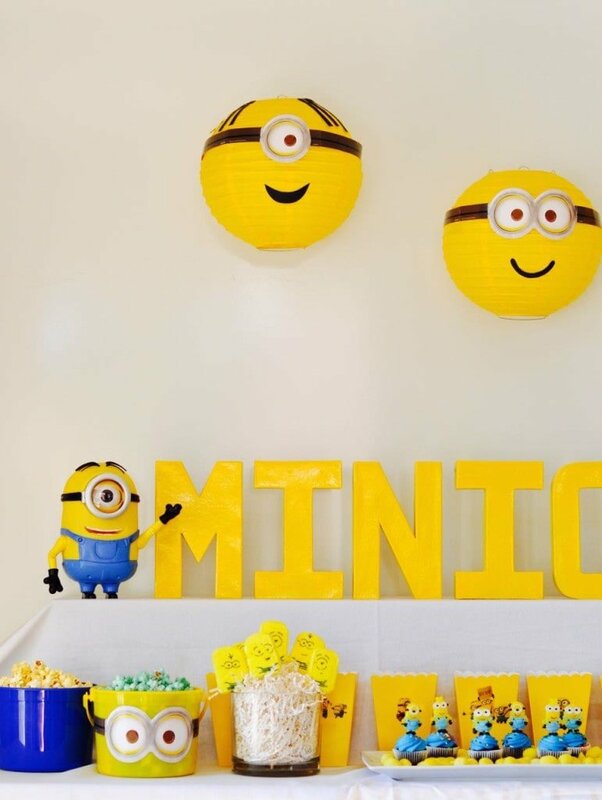 I’m going to show you how I put together our fun minions party in our living room, and give you some tips and lots of ideas for throwing your own minions party too! I picked up the Blu-Ray/DVD combo pack of Minions © 2015 Universal Studios. All rights reserved. I bought it the very day it came out, on December 8th. Yep, we were excited! You can buy the movie at any of the retailers listed on the Minions movie website. The first thing I think about when throwing a party are the theme, the colors, and the decorations. I already had the theme, the colors were pretty obvious to me (blue and yellow like the minions, with some white to break it up), so it was time to start thinking about the decorations. 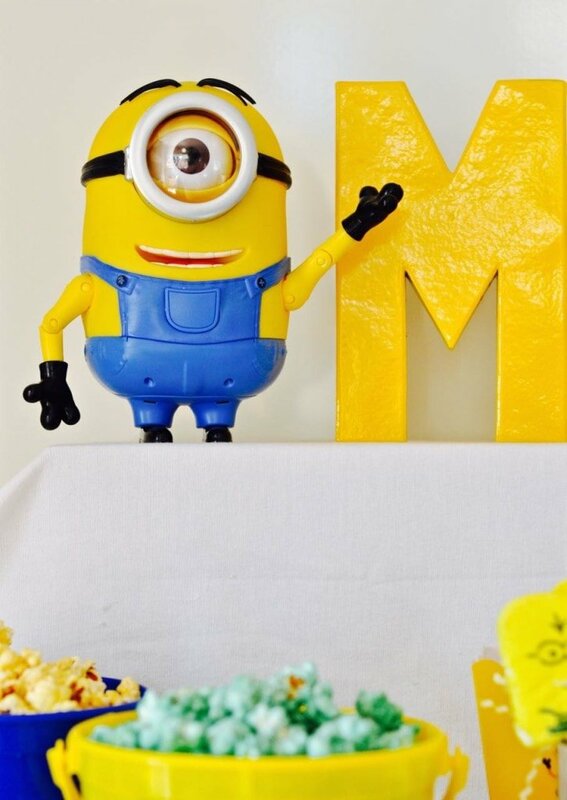 I fell in love with two talking minion toys, Dave and Stuart, and knew they’d be perfect for the party. They looked great and the kids couldn’t stop playing with them! They say funny phrases and make all kinds of noises (yep, that noise too). I put one on each end of the top portion of my party table. 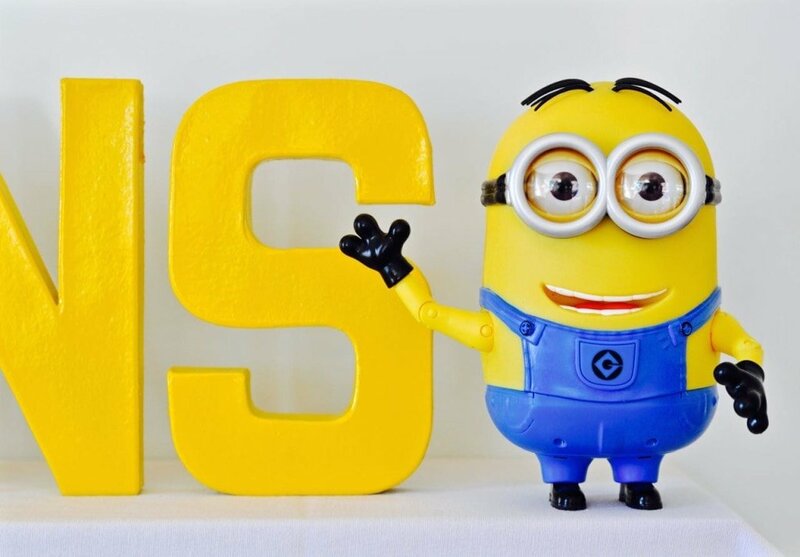 I love the classic clean look of Illumination Entertainment’s Minions movie box with the yellow word “minions” on it, so I mimicked it by picking up some paper mache letters at the craft store, first spray painting them white, and then adding a coat of glossy yellow spray paint over the top. The letters were so bold and I loved their graphic look on the table! Dave and Stuart look amazing on each end, don’t you think? 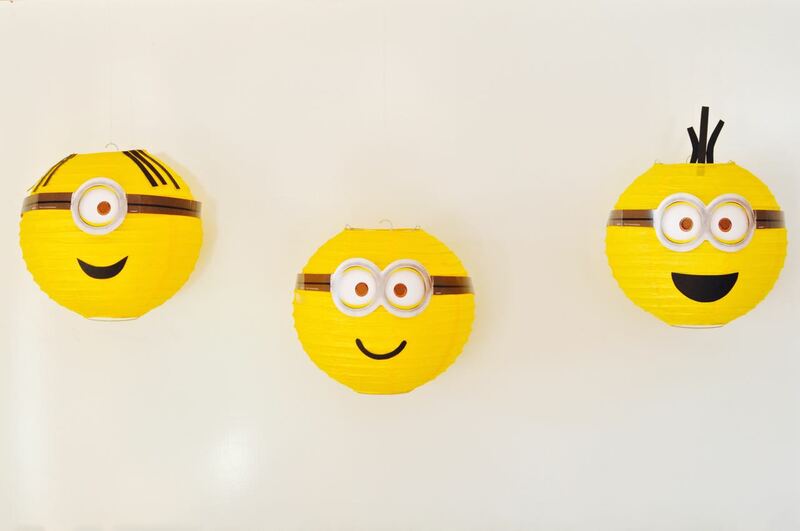 Hanging minion paper lanterns were the next decoration I made. These were SO easy but look so good! Step 1. Open up the paper lanterns. 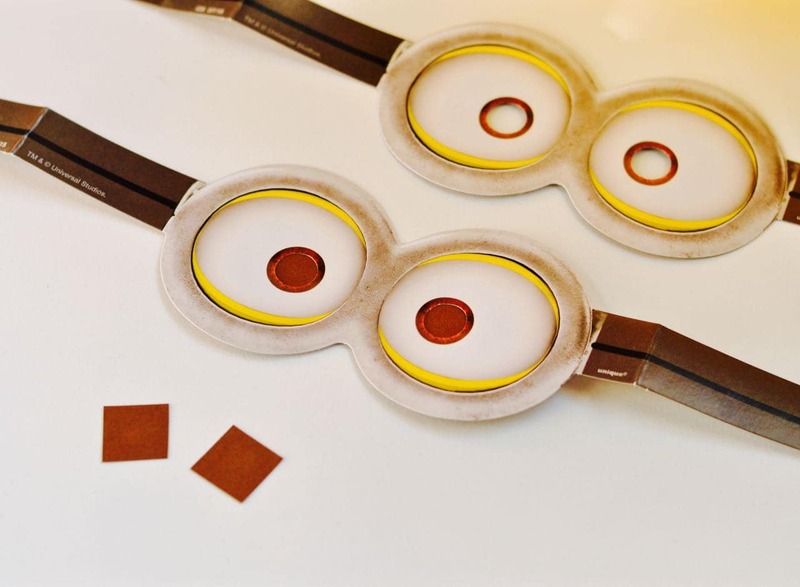 Cut a small square out of brown paper and tape on the inside goggle eye holes. Tape the goggles to the middle of the paper lantern. Step 2. Cut out a few different smiles from black paper, then glue onto the lanterns. 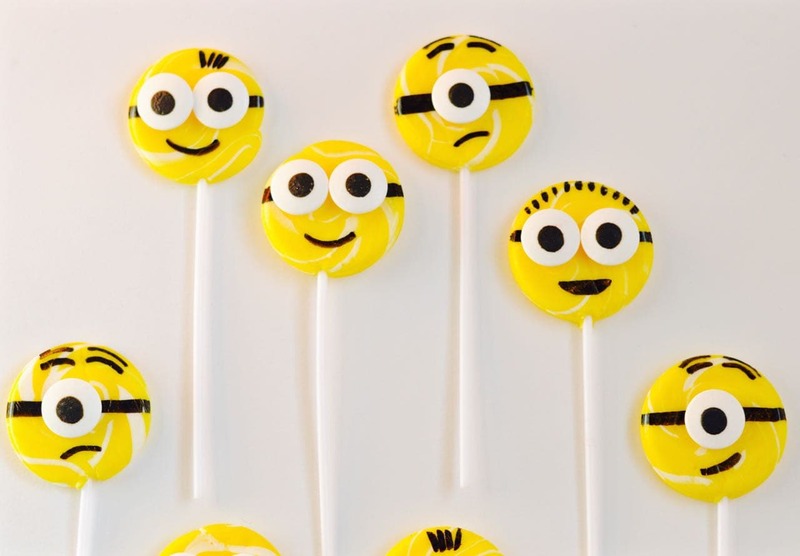 I looked at pictures of minions to see what their mouths usually looked like. Step 3. 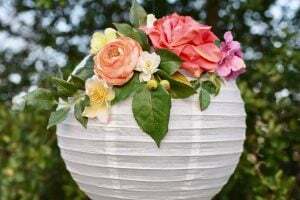 Cut a few strips of black paper for hair and glue or tape to the top of the lanterns. Again, it will help to look at minions pictures to see some of their different hairstyles (for those that have hair- sorry Bob). Step 4. 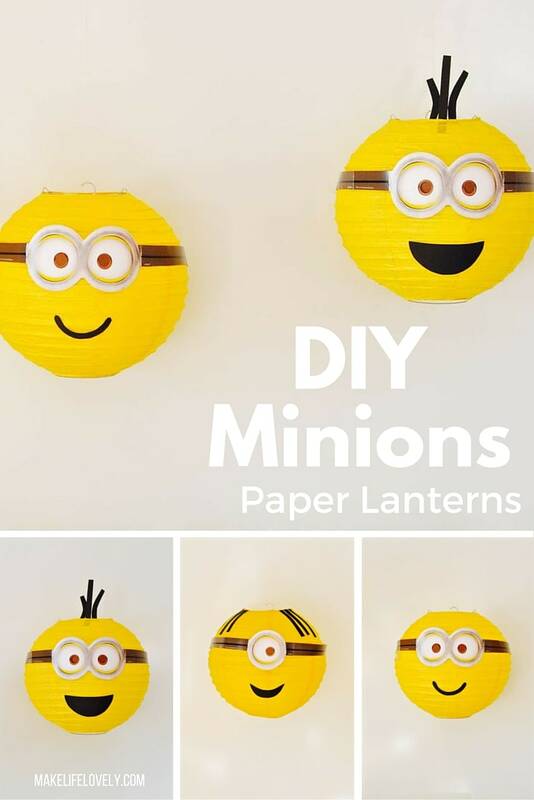 Now simply tie a piece of string to the top of the lantern and tape the top of the string to the ceiling with tape so that the minions hang over the table. Seriously cute, right? You can totally make these and wow your kids with your creative skills and fun party! You can’t have a party without food, right?! Our party was after we had already eaten a meal, so I included snacks and treats for the movie. 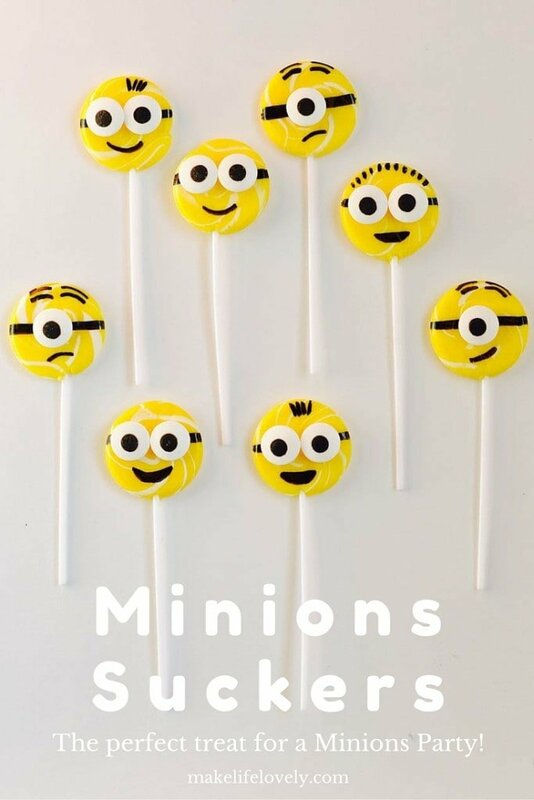 My favorite treat was the minions suckers I created. I made mine ahead of time, but this would also be a fun party activity for the kids to do as well! Step 1. 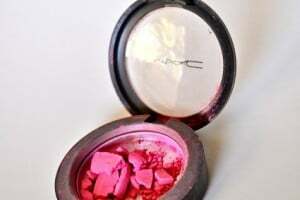 Remove suckers from the packaging. Draw a black band across the top middle of the sucker for the goggle straps with the edible food marker. Step 2. Use a little bit of frosting on the back of the eyeballs and place them over the black goggle band. Press to adhere. Step 3. 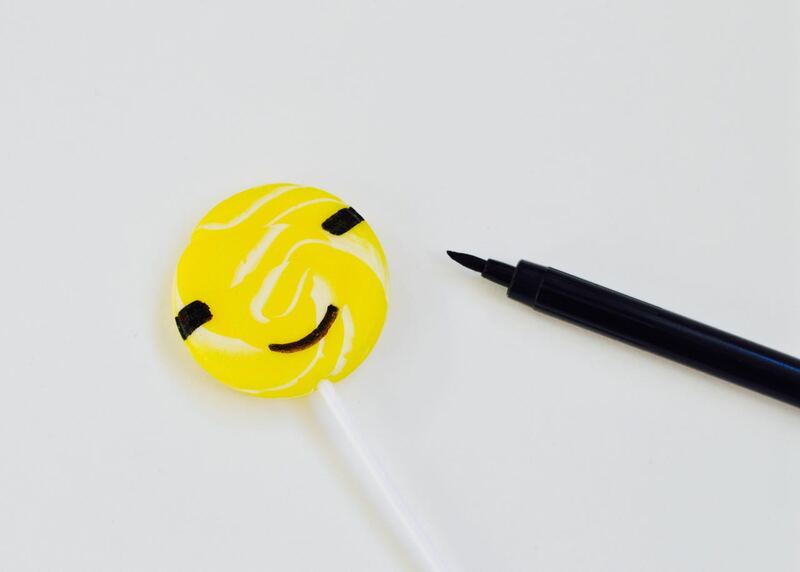 Draw a mouth and hair on the sucker with the edible marker, then let it dry. If you do this shortly before the party then you don’t have to wrap the back up, but if you do this ahead of time, then you’ll want to wrap back up the suckers in a sucker bag and tie it. Just be sure the ink is dry before wrapping them up. Seriously, aren’t they cute?!? I’ll admit that Bob is my absolute favorite in the Minions movie, so I had the most fun making him. My four-year-old knows all of the minions’ names, and said “You made a Bob sucker?” with wide eyes and a big smile. 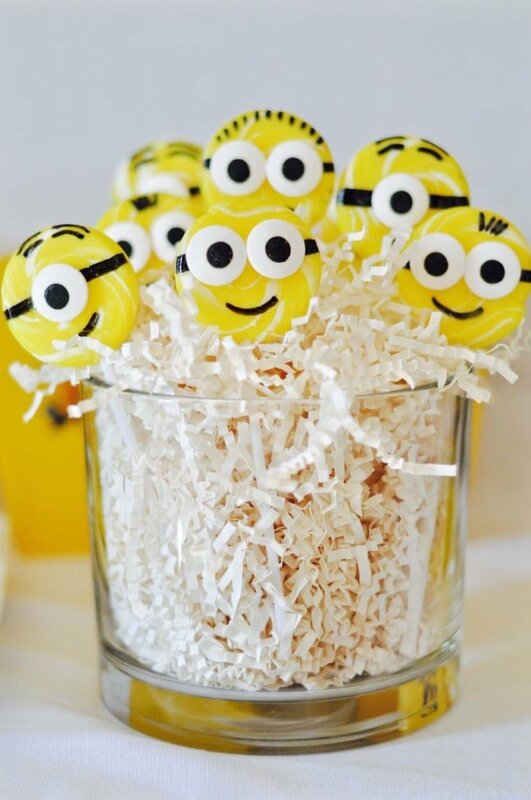 I placed the minions suckers in a small round glass container I had and stuffed it with paper shreds, then put the suckers stuck right in! 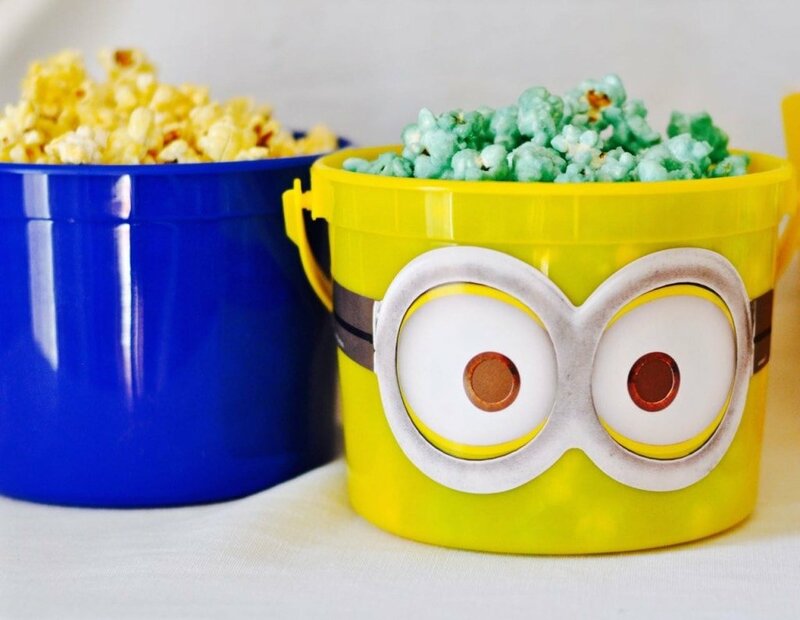 I also made some homemade minions popcorn in blue and yellow. This is one of my favorite party treats to make because it’s so bright and colorful and easy to do. 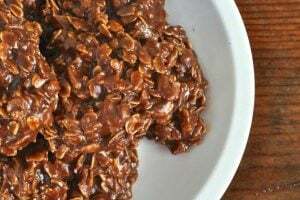 I followed the same recipe I shared HERE with you a couple of years ago if you’d like to make your own. The fun thing about this colored popcorn recipe is that you can customize the popcorn with any flavor and color that you’d like! 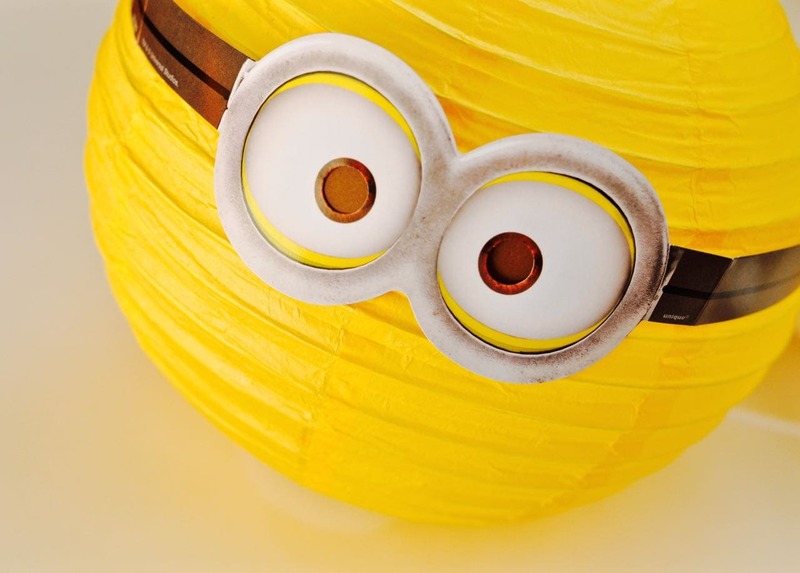 I dressed up two yellow plastic pails to look like minions by taping some of the extra goggles to the pails. Easy! Then I added the blue popcorn to the yellow pails, then added the yellow popcorn to the blue pails. To make it easy for the kids to eat the popcorn, I bought some yellow popcorn boxes and added a minion sticker to the front of each one. 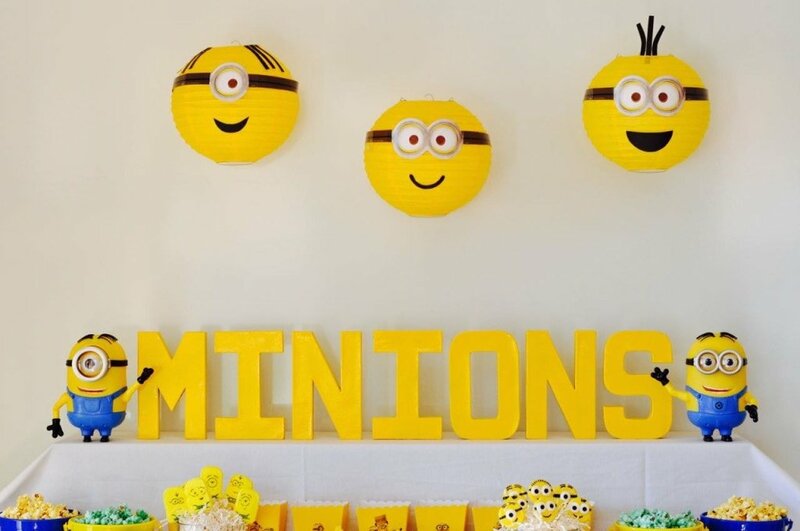 You could also let the kids decorate their own popcorn boxes with the stickers at the party. I left the popcorn boxes empty so that the kids could pick which popcorn they wanted- lemon, blue raspberry, or both! While in the baking aisle at the store I saw some adorable gummy minions. I picked up a pack of mini blue-frosted cupcakes, added a toothpick to the bottom of the gummies, and stuck them into the mini cupcakes for a cute treat! 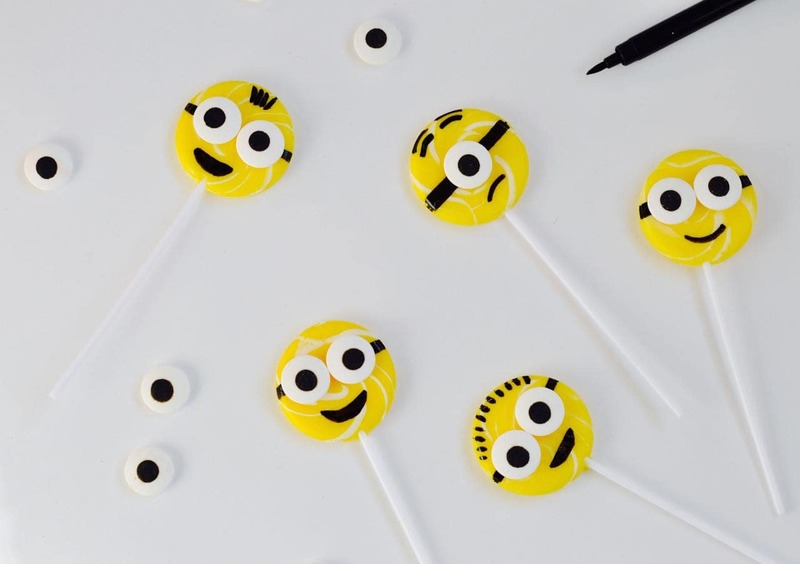 These took all of two minutes (if that) to make and were a great addition to the minions treat table! 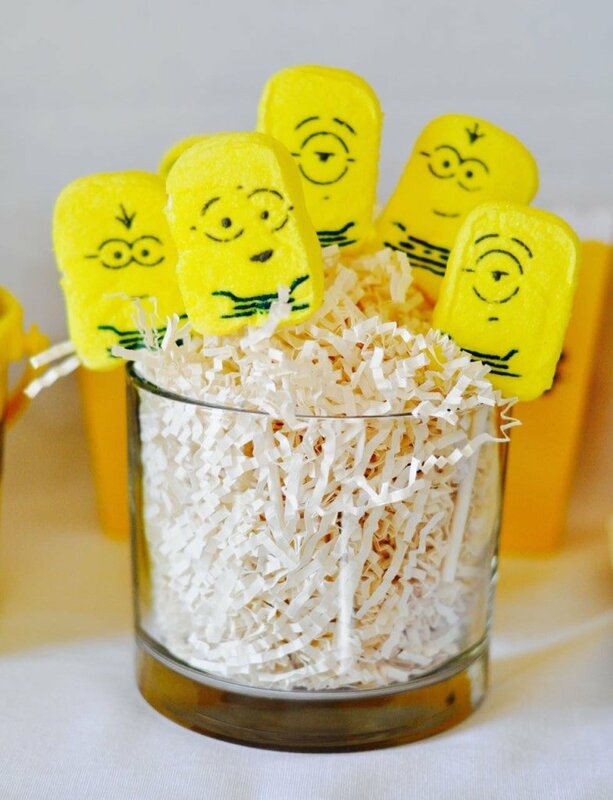 Did you know that they make minions marshmallow treats now? 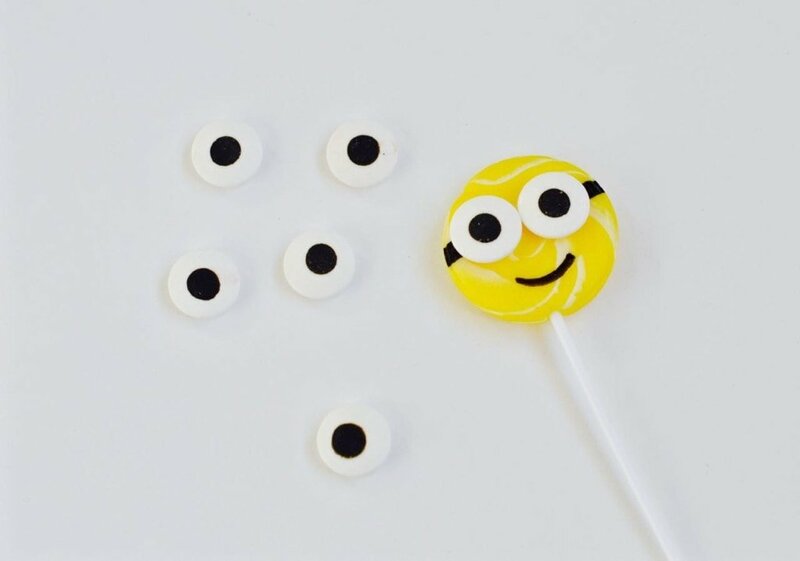 I bought a pack, then added a sucker stick to the bottom of each marshmallow treat for instant minion marshmallow pops! Again, another easy, two-minute treat that the kids loved! 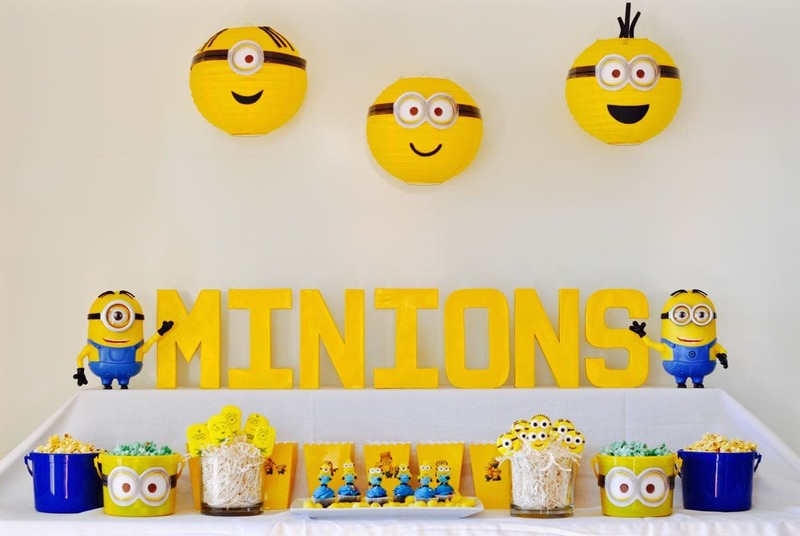 The main activity of the party was to watch the new Minions movie. Before the movie, though, I thought it would be fun to do a minion finger puppets craft with the kids. Step 1. I prepped the felt pieces ahead of time so the craft would go smoothly, not take too much time before the movie, and wouldn’t be frustrating for the little ones cutting some of the small pieces. 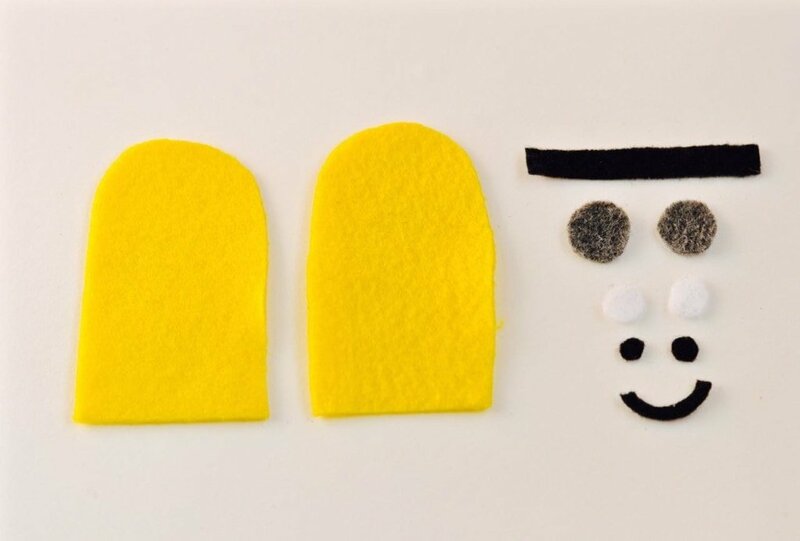 I cut a bunch of the pieces ahead of time, then used a glue gun to glue the side and top of the two yellow pieces to make a finger puppet. Step 2. 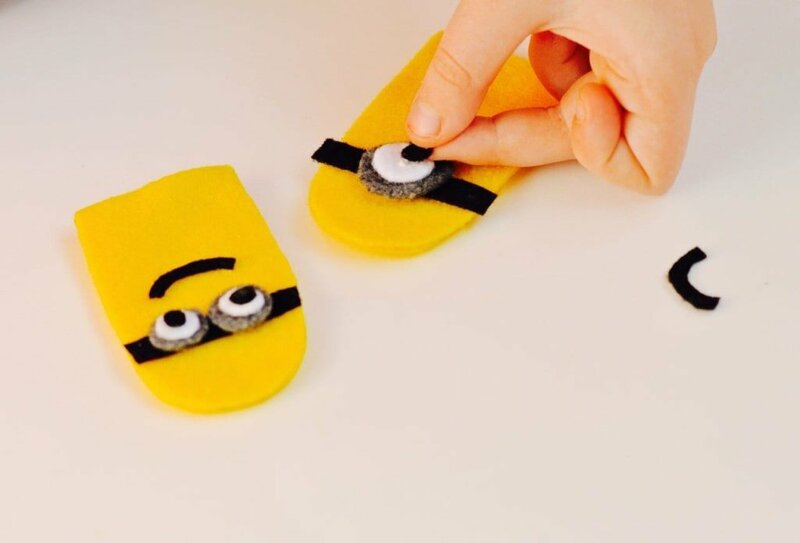 When it’s time to craft with the kids, simply put out all the pieces, and let the kids glue them all together to make their minions. 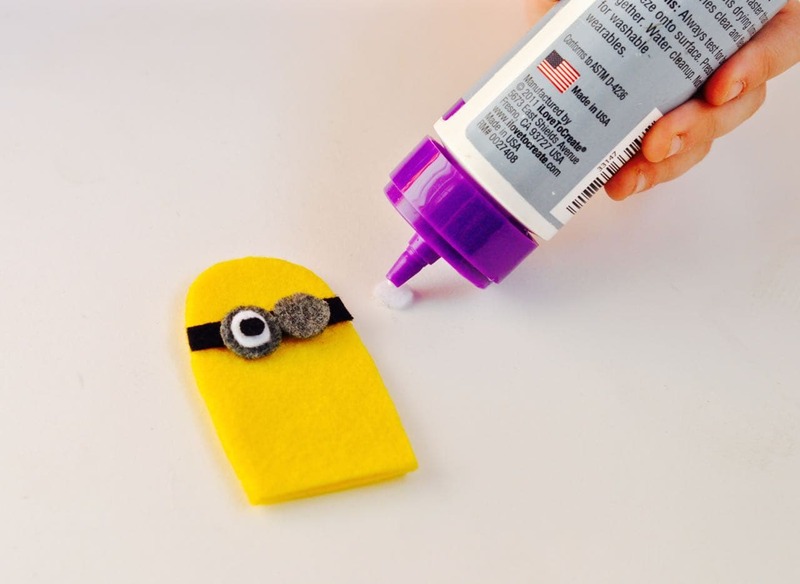 They can make their favorite minions, or use their imagination to create their own minion! 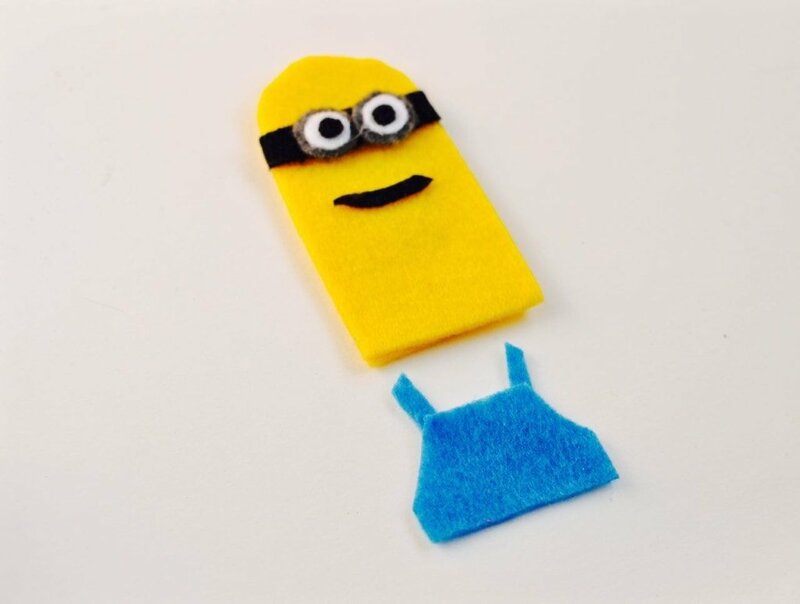 Older kids can cut their own felt pieces too, but I knew that my youngest can’t cut felt and wanted the craft to not be too difficult for him. 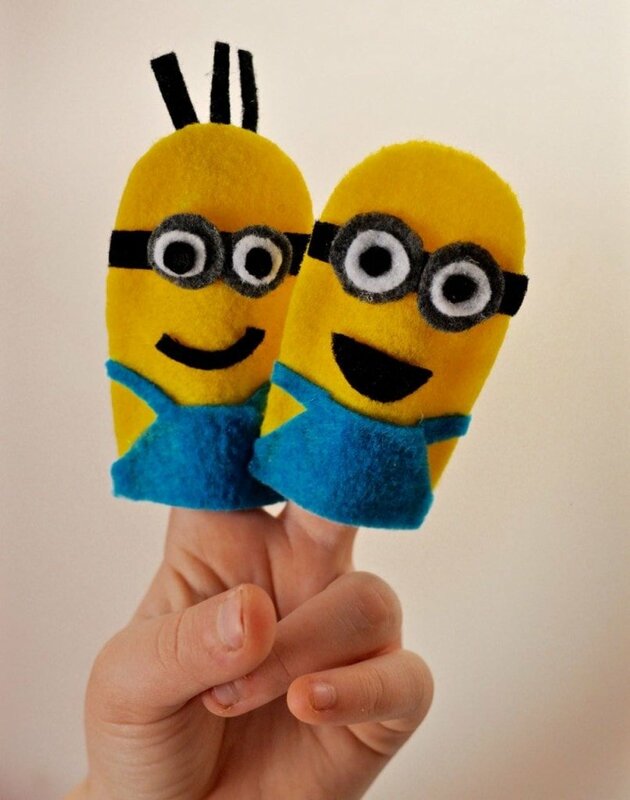 Now the kids have their own minions finger puppets for imaginative play after the Minions movie is over, or to play with even during the movie! 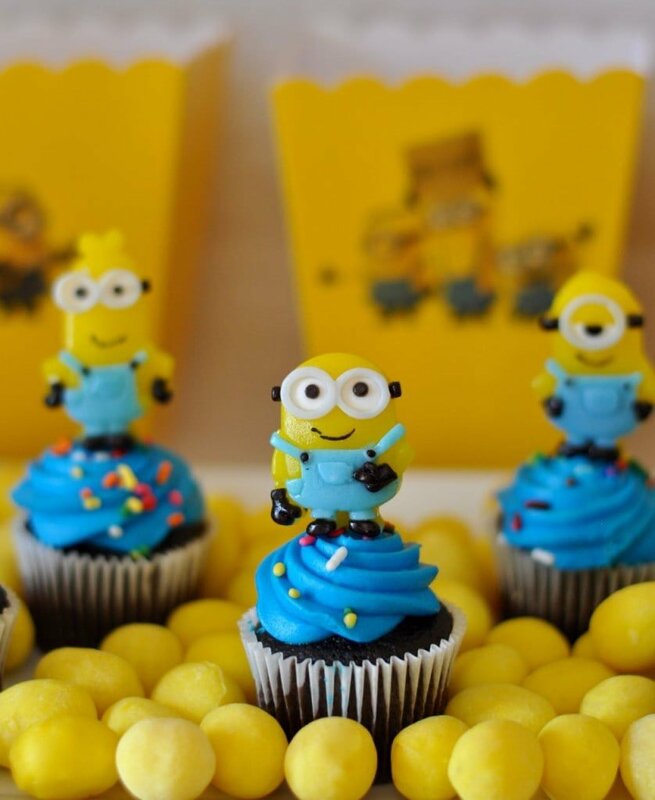 I hope you enjoyed all of the details of our minions party! My kids had a great time and I had tons of fun with it. I know that my kids will carry these memories that we’re making for a long time, and as cheesy it may sound, that alone is worth every minute of the time spent putting this fun party together. 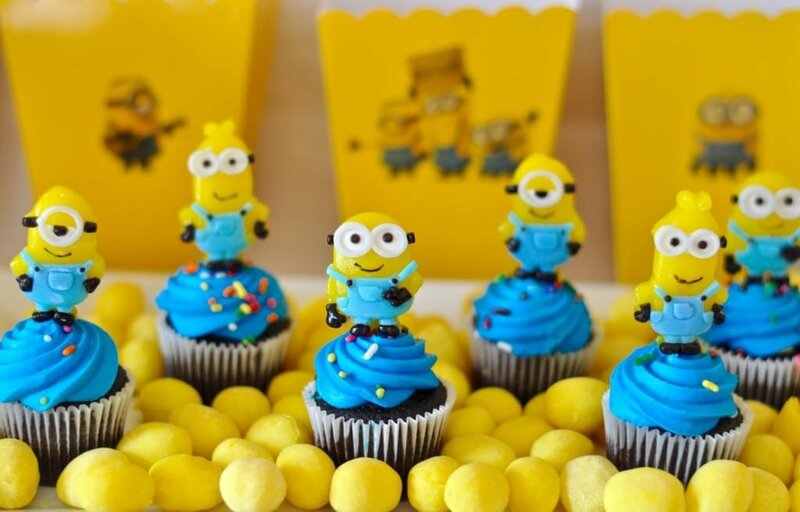 What’s your family’s favorite movie night treat?